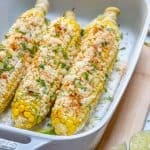 Perfect corn on the cob recipe made with Cotija Cheese, Garlic Salt, Lime Juice and some Chilli Powder for some extra heat! Cut 4 pieces of aluminum foil large enough to hold a cob, then place a cob on each piece. Brush each one with melted butter, and sprinkle generously with garlic salt. Seal the edges of your foil to form packets. Bake, or grill, for 30-35 minutes or until tender. Once the corn is done, carefully remove the foil and brush the corn with sour cream. Sprinkle with cheese, chili powder and cilantro on all sides. Squeeze lime over and enjoy!